I have had many debates with people about the pros and cons of different art media and of course those who know me realize I love all of them. But probably the most unusual, and quiete difficult to work with, is painting with chocolate. Melting the chocolate to a creamy consistency it can be applied most easily with palette knives or fingers. Tomorrow I will be at Latrobe for their annual Chocolate Winterfest. This event has grown every year and includes a huge range of chocolate inspired activities. My painting with chocolate demonstration is just one of them. The pictured work on canvas of The Nut at Stanley is a practise as you will appreciate that this is not my usual medium so before “performing” in public a little rehearsal quells the nerves a little.. 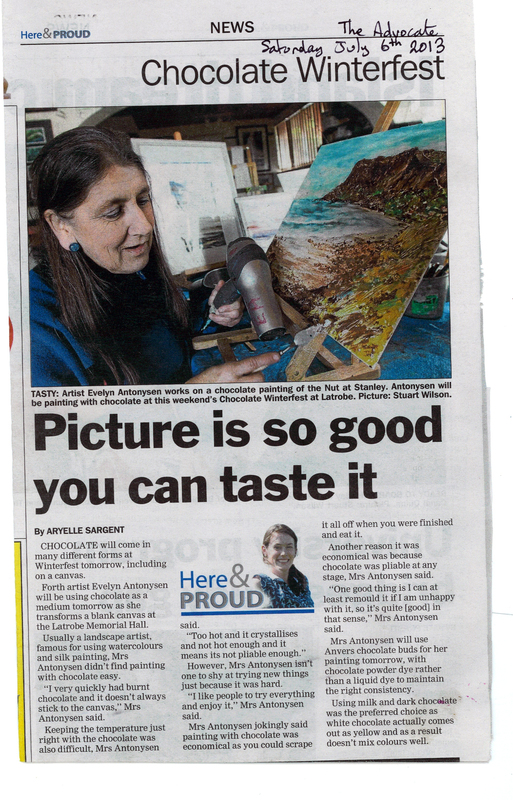 This entry was posted in demonstrations, painting, Tasmanian artists and tagged chocolate art, Cocolate Winterfest Latrobe Tasdmania, Evelyn Antonysen, painting of the Nut Stanley Tasmania, painting with a palette knife, painting with chocolate, unusual painting media.